Mbeki – an era of lost intentions? THE Mbeki era birthed out of the short-lived Mandela presidency, and which lead to the longest economic expansion seen in South Africa since the end of WWII, will be seen as a period of lost opportunity and missed intentions. The current Zuma crisis in which a mysogenistic Zulu chauvenist is exploiting a gulf of disgruntlement by the masses with the class divide and Mbeki’s two-economies approach, will invariably lead to the fascistic paternalism that we all fear as a nation. Perhaps it is because Mbeki, forever the statesmen and South Africa’s black Jan Smuts, has never managed to leave Mandela’s shadow, too aloof to make an emotional connection with the mob in the same way that “Papa Zumu” has with those who still remember the internal struggle. It really all began on Women’s Day with the sacking of the deputy minister of Health. If that wasn’t enough to bring down the presidency, then an angry lumpen proletariat upset by the president’s toenadering with the G8 and the failure to articulate a consistant land reform programme or social security system that meets the needs of the majority has. Zuma wrought his revenge by positioning himself as the alternative to the Mbeki administration. The result has been a trumping of the process that created Mbeki. Surely a reversal of history in which FW De Klerk fought PW Botha for the presidency of the country as well as his own party? With any luck, the party will split into two, as political conditions normalise. The prospect of a real “black” opposition that could play the role of a Tory/Labour two-party system, would really mean the normalisation of political discourse in South Africa, informed as it is, by the period immediately prior to the first democratic election. Zuma’s moral regeneration programe has unfortunately also struck a cord with those too stupid to recognise the fact that Hitler’s Nazi Youth also gained power by manipulating the democratic system. Will the left be able influence Zuma? After rejecting Mbeki-lead reform, the press are probably to blame for the defeat of the Mbeki-camp and will have a hard time persuading anybody that Zuma isn’t Chavez in disguise. What is worse than having a president who doesn’t believe in HIV? Having a president who doesn’t actually read. Zuma suffers from a condition common to a lot of South Africans, functional illiteracy. He never went to collage, and still believes that a woman’s place is, surprise, surprise, in the kitchen. Then, I guess South African’s get the president they deserve, as so many socialists and children birthed from colonialism make the only choice really available to them – choosing a Big Man, who will possibly level the playing field, without the finesse and bourgoise notions that lead Mbeki astray. 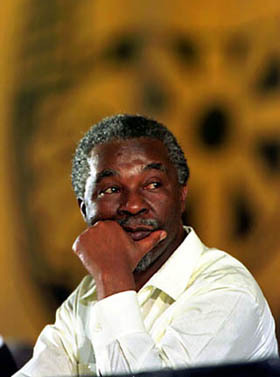 If there is any criticism of Mbeki, it is the fact that he never managed to make the bold moves that would have separated his presidency from Mandela, to carve out a name for himself, not merely on the international stage, but amongst the grassroots masses that have made South Africa what it is.